It’s criminal. Folk spend fortunes putting together super-sonic motors, only to skimp on the oil they use. Why? Oil’s oil right? Wrong. Even if it’s a standard engine, it deserves TLC considering it's extremely hostile working environment. Oil is literally the engine's life-blood. The opening few sentences are astonishingly true. Oil isn’t there just to prevent all metal components within an engine fusing together in the first few seconds of running, creating a total melt down of Chernobyl proportions. It’s an intricate blending of chemicals to protect the engine as a whole. The most commonly uttered statement about engine wear is most wear occurs within the first 10 minutes from start up when cold. True if cheap chip fat oil is used. In performance and race engines, a considerable amount of wear is created by heat, load, speed, and pressure. Again, cheapy oil won’t give protection here. On the other hand, a good oil should give protection under both extremes. Oil has to perform four basic functions. Lubrication is the obvious one, then there’s cooling, cleaning and sealing. Cooling and sealing capabilities are controlled by the base oil quality, lubrication and cleaning by additives. Then there’s the dreaded grading of oils - something that confuses most at best, and related terms banded about by the ill informed - such as ‘viscosity’. I’ve lumped these two together as the oil’s performance in these departments as previously stated is largely controlled by the quality of the base oil - essentially just hydrocarbons. It cools by absorbing heat from the metal components - such as crankshaft, piston crowns, piston skirts, camshaft, etc - conveying this back to the sump where the heat is dissipated into the bulk of the oil. Generally most oil from major manufacturers does this fairly efficiently. However, it’s one of the functions that some fully synthetic oils haven’t yet equaled - and there are one or two top brands particularly inefficient at this! Sealing is mainly concerned with the piston rings, providing a barrier between the relatively rough metal surfaces of bore walls and piston rings. Again, base oil quality determines how well this is achieved. Now we start with the additives. The base oil can’t perform this function on it’s own. In fact it contributes more to residual carbon deposits (that blackening of engine components, particularly where regular oil changes have been ‘forgotten’) than controls it. Detergents and dispersants are used to help keep engine parts free of the ‘black death’. These are generally calcium, magnesium, and nitrogen. Some oils are sold on their ability to do this more effectively than others - basically containing more detergents than others. This isn’t good in your Mini engine. High detergent levels cause premature gearbox wear. Manufacturers of oils aren’t bound to list the make-up of their oil like you find on cereal packets, so identifying this is a problem. Those possessing high detergent levels, however, do actually smell very washing up liquidy funnily enough. And even stranger they also tend to be green in hue! I must point out that this green-ness doesn't automatically mean a high level of detergent though. So to the ‘big one’. Lubrication is actually multi-functional. The oil has to reduce friction, making sure all engine parts are nice and slippery and protect them from excessive wear. It’s also the only function that can increase horsepower where more specialised additives are used. The majority of commercial manufacturers use sulphur, phosphorus, and zinc. The more specialist manufacturers, after extensive research and testing, have found that adding quite ‘exotic’ chemicals containing such as phosphorus esters and molybdenum increase power outputs as well as further reducing wear. Wear is the permanent removal of surface metal caused by friction. Consider the relevant diagrams (diag.1 & 2) - it’s far easier to illustrate than explain in words. Higher quality - and generally more expensive unfortunately - oils protect against this far better than those at the budget end of the spectrum. More specifically the additives used. At start-up, where oil has drained off components during inactivity, it’s the additives that reduce wear here. Now the engine is running, the oil has to deal with a multitude of situations created by temperature. Higher engine rpm drastically affects running temperatures of engine parts, particularly in the upper cylinder and valve train components. The oil has to perform at differing film thicknesses on extremely hot surfaces and far cooler surfaces. Therefore the oil is a different viscosity in the sump than the upper cylinder, exhaust valve stem, inlet valve, cam followers, piston skirt, etc. etc. As can be seen from this, the viscosity (explained later in more detail) of an oil is of ultra importance. What manufacturers call 'fluid film lubrication'. Too thin a film between two metal surfaces sliding against one another, the surface metal (high spots on the surface - see diag. 2) get too close, finally making contact. On extremely hot surfaces such as the upper cylinders and exhaust valve stems, the oil film becomes so thin it can disappear completely. This is where the additives used step in as a secondary lubricant. The better the additives (again, generally not in the cheaper oils) the more protection against wear there is. Particular types leave protective deposits on exposed metal surfaces even when the fluid film has gone. And as you will see, power gains can be made. The most savage example of this in a normal running engine is the upper cylinder - see diag.3. From these you can see as the piston moves down the bore on the induction stroke, the rings scrape oil off of the bore wall leaving the barest of smears. This is extensively washed off by the incoming fuel, leaving the rings to slide on basically bare metal. The fresh mixture charge is ignited, forcing the piston down the bore on its power stroke. The rings again reduce the oil film on the bore walls to a mere stain, this then being burnt off so on the exhaust stroke the rings are once again sliding on bare metal. So every two strokes in your poor old Mini engine, the rings are sliding on essentially unprotected iron. 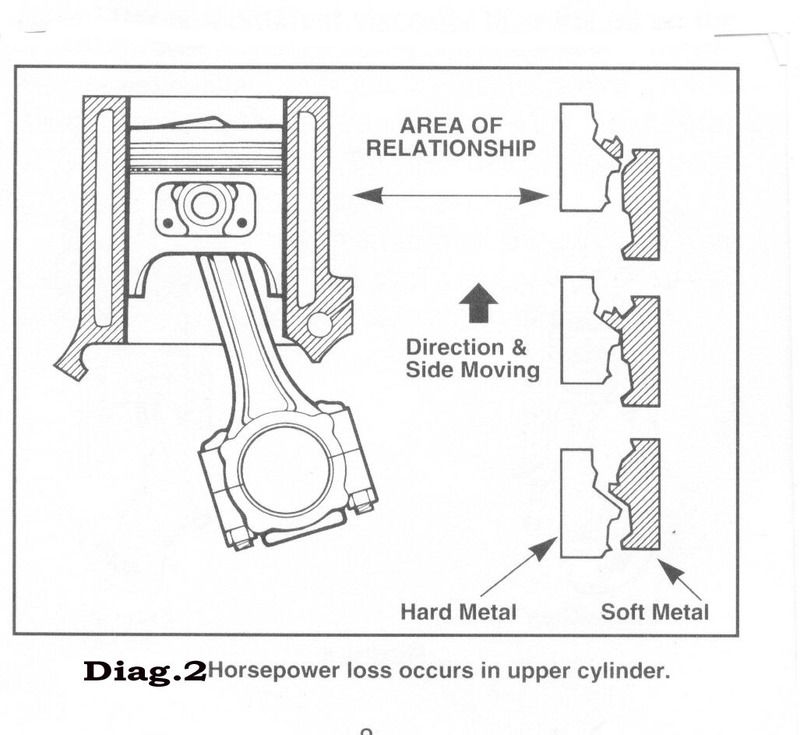 This is why 75%, yes 75%, of friction generated in an engine occurs in this relatively small area. Astounding when you consider how thin the rings are. Consequently there’s a massive amount of wear generated here, not to mention power loss. Friction is the resisting force to motion. There are many forms of friction - fluid friction, solid friction, rolling friction, sliding friction, stick and slip friction, etc. The main items of interest to us are solid friction and fluid friction. We’ve had a brief insight into solid friction in the ‘wear’ section, and as with practically all institutions the oil industry has a standard by which friction is measured. This is used to determine a particular oils wear properties (friction reduction). Diag.4 shows the basis of the test. Zinc (or more precisely oil-soluble zinc - zinc dithiophosphate) is used as it is recognised throughout the industry as one of the best anti-wear/anti-weld additives that is plentiful and cheap, therefore widely used in budget motor oils. Phosphated molybdenum, phosphated zinc, and phosphorus ester are far superior in performance but are also far more expensive to produce and blend in exactly the right proportions. The end product is therefore more expensive. To give you some idea of what’s what here, the co-efficient of friction of iron on iron is 0.51. The co-efficient of friction of zinc on zinc is 0.75. The bigger the number, the more friction. 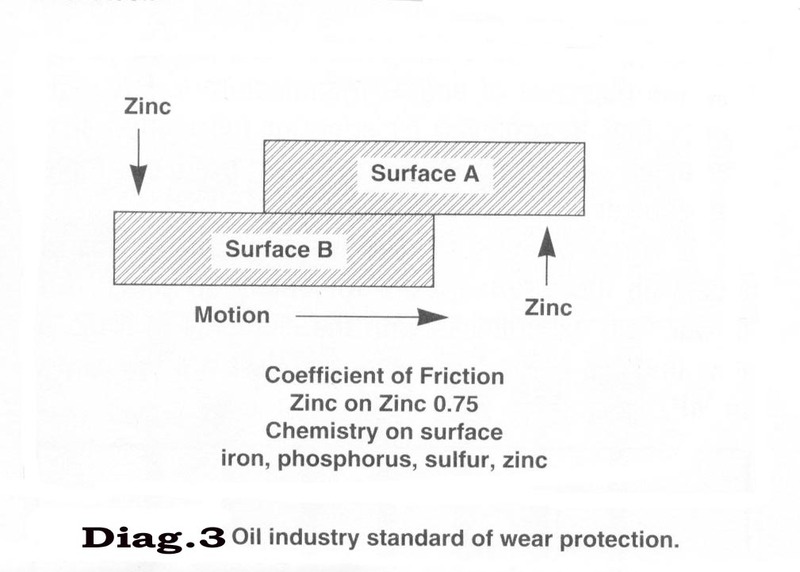 Weird that zinc is used considering it causes a massive 32% increase in friction. So why on earth does the oil industry use this in its oils? Basically for reasons outlined earlier - it’s very cheap, plentiful, and excellent at wear reduction. The cost to you is a loss in horsepower to the tune of approximately 3%. Not so bad really - but why loose it if you don’t have to? A very few specialist oil manufacturers can re-coup that loss - at a reasonable price. Particularly where increased or maximum performance in a fast road car or any racecar is the goal. The more expensive and carefully crafted elements mentioned produce a co-efficient of friction of 0.44, a massive 41% reduction. A bonus is a 40% increase in wear protection at start-up. The best oils also increase fuel economy through friction reduction. Fluid friction then is the internal friction within a stream or film of fluid - in our case oil - and is related to its viscosity (there’s that word again!). So for us viscosity is the oil’s resistance to flow. Conversely viscosity is the oil’s ability to flow. Low viscosity oils have less flow- resistance than high viscosity oils, are easier to pump, and circulate through the engines oil galleries faster. Low viscosity oils give a lower running pressure, but allow the oil pump to deliver a higher volume through the galleries. High viscosity oils perform in the exact opposite way. As oil temperature goes up, the viscosity goes down. The internal friction of oil thus rises and falls with temperature. There are definite power gains to be made by increasing the lubrication systems efficiency utilising reduced fluid friction by lowering oil viscosity. BUT the correct selection/application is imperative. 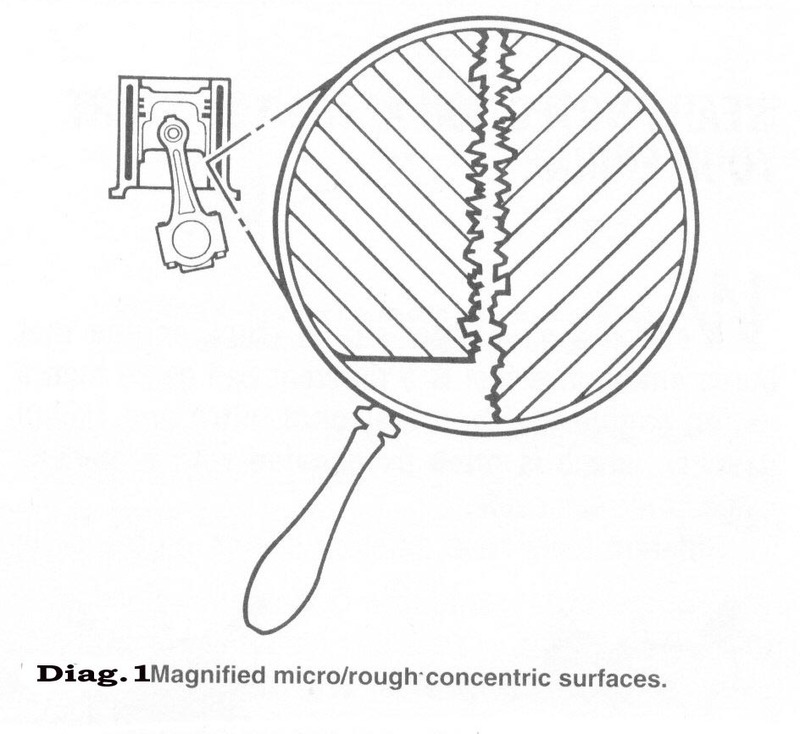 Low viscosity oils produce thinner fluid films when hot, to a point where the oil film becomes too thin - allowing high spots on opposite surfaces to slide against each other. This increases friction, power loss, and causes excessive wear. Motor oil is described by its manufacturers using basic information. Supposedly to make direct comparisons with other oils easy - most of which are multi-grades. We’ve all seen this on oil cans/bottles - SAE 20W50. So to kick off with, we’ll deal with the lettering. SAE stands for ‘Society of Automotive Engineers’, basically a body of people who determine how oils should be graded/compared by fixed tests. ‘W’ is most definitely NOT ‘weight’. I’d love a pound for every time I’ve heard some one refer to an oil grade by its ‘weight’. It actually stands for ‘winter’. Simply because the grade implies the performance of oil in sub zero temperatures, and applies to the first number. Higher numbers describe higher viscosities, i.e. thicker oils. Some oils are described purely as straight grades (i.e. SAE40) because they can’t pass the low temperature viscosity test. If it did meet one of the ‘W’ tests it’d be a multi-grade. These are generally used in race engines that are unlikely to come up against sub zero temperatures. 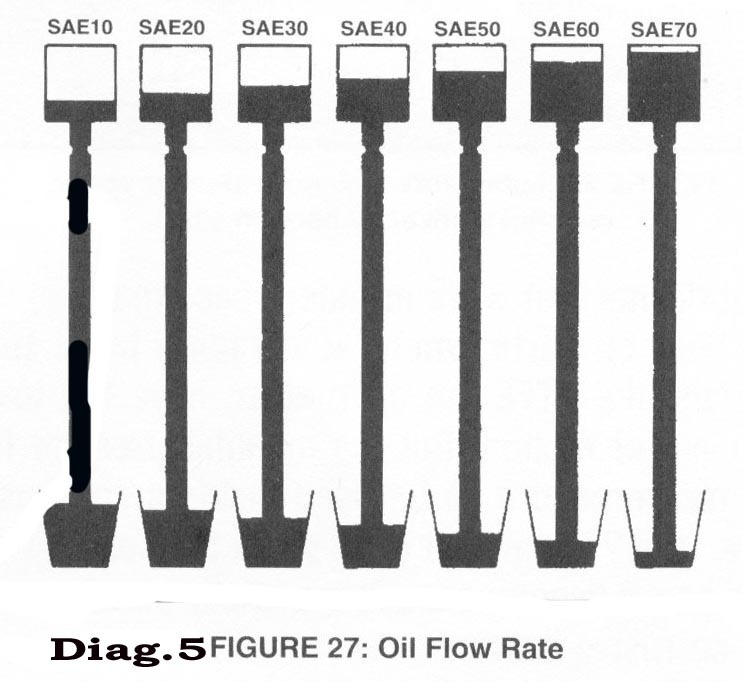 Take a good look at diag.5, this shows how the basic SAE is measured - essentially how fast a fixed amount of oil goes through a specific sized hole at an equally specific temperature (centistoke - cst) and is the basis of comparing the main (high temperature) multi-grade component - the second figure in the specification. 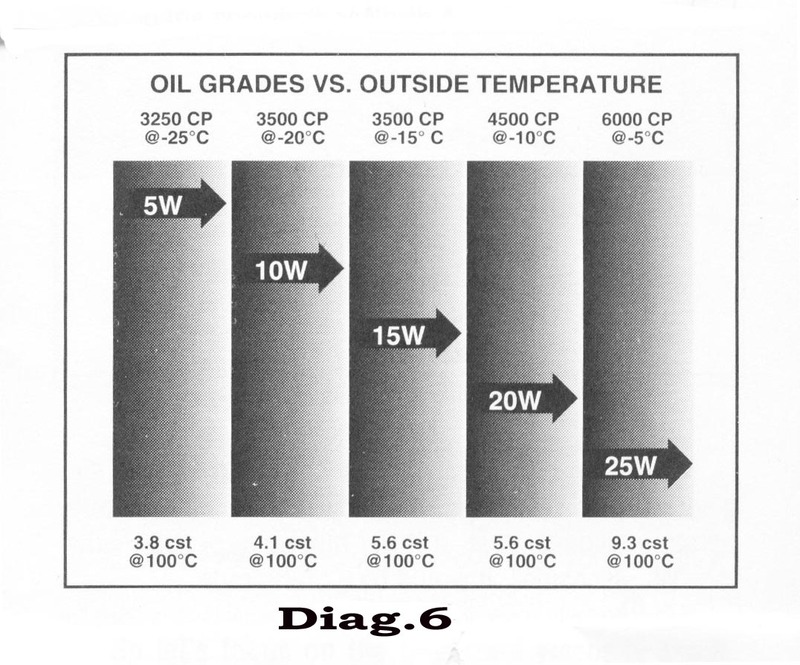 Diag.6 compares oil grade against outside temperature (centipoise - CP, believe me you do not want to know how this is determined!!) and deals with the sub zero performance of the smaller oil component - the first number in the specification. Diagram 7 gives the exact data performance for each component. I don’t want to dwell on this one as full diagnosis is a books worth on it’s own. Suffice to say many after-market additives exist. If they were as good as they claim, commercial oil manufacturers would be blending them into their base product. Try and find a commercially- manufactured oil that contains PTFE for example. Some are potentially disastrous as they are so thick they stay like that when added to the sump oil - causing possible oil starvation by blocking the pick-up pipe. Most of these are ‘old’ names that were around when oil was in its infancy, degrading in a very short time so needed ‘thickness boosters’. Basically my advice is buy the right oil, and avoid additives like the plague. I’ve deliberately avoided dealing with synthetic oils (a very science-orientated subject) as this was conceived to deal with the basic functions of motor oil - which encompasses synthetics, as they have to do the same things and conform to the same tests. Oil technology has out paced mechanical technology by a long, long way. Superior lubricants will cost more. BUT any self respecting advanced fully synthetic oil will last up to eight times longer than a cheap mineral multi-grade oil - so is actually cheaper long-term. Particularly when considering the right choice of oil will reduce friction, boost power, and therefore fuel economy. Look carefully - there are some astoundingly good oils out there. Ask the professionals.